Last night I dug into the tray of half-painted models and tried to push a few over the line. One that made it was this characterful sculpt from Tony Yates. He was a giveaway from BOYL 2016, and would make a great NPC for any sci-fi skirmish. This is going to be a big report, so I’ve decided to split it up to make it more manageable (and get something posted). I’ve got a good selection of Ramshackle Games trading goods painted up for next month’s BOYL game. 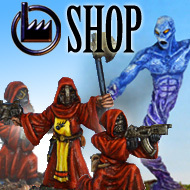 We are planning a ‘sandbox’ style game where players can bring a gang, and compete to make money at the rough fringes of the Imperium in Helsreach, Logan’s World. One of the key elements for the Inquisitor Cynole game at BOYL last weekend was the ornithopter. The story snippet from the original Chapter Approved that this game was based on describes it as follows “The ‘thopter was a local model, ancient and noisy, the dull beat of its engines drowning any attempt at conversation”.